Manggar city in East Belitung is the second largest city in Belitung Island. This city is a sub-district and the capital of East Belitung regency. The center of Manggar city is in Baru Village, that contain of numbers of ethnicity like Malay, Chinese, Bugis and else. Manggar at ancient time was the center of tin mining that runs for business since Dutch colonialization until Indonesia new order. 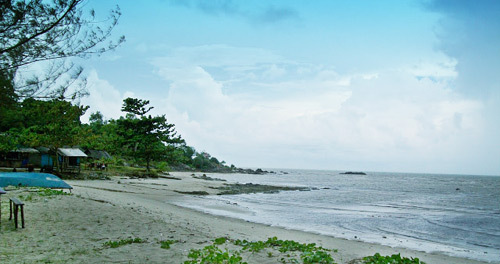 As a destination city, Manggar keeps various tourism sites that have the same beauty in Belitung regency, particularly in Tanjung Pandan and Belitung. Some of tourism obyect in Manggar is Serdang beach, Nyiur Melambai Beach, Keramat beach, Teropong beach, Olie Pier beach, Semak A1 hill and numbers of historical buildings. In addition to the tourism sites, the uniqueness from this city is the existence of 1001 warung kopi or coffee stalls. Hence, this city is also named as “Kota 1001 Warung Kopi” or the city of 1001 coffee stalls. Warung Kopi or coffee stalls are available in almost every corners of the street in Manggar city. Surprisingly, those stalls are never been dull and always been crowd by the visitors. The coffee stalls at Manggar are built in a simple architecture, with roofing and bamboo walls. This is the characteristic of Manggar coffee stalls. Never ask for Wi-Fi Password, for there are no such facility at most of traditional stalls. There are no sofa and TV, and other modern things just like a cafe shop inside the mall. Those Manggar coffee stalls are available for those who want to mingle and socialize with other in humble ways. By spending Rp. 3000 – Rp. 6000 per glass, you will get delicious traditional coffee with friends and family. Warung Kopi Manggar is like part of culture in Manggar city and it been already there since ancient time.